These museum quality Giclees (zhee-klay) are printed with archival pigment inks, on heavyweight, Premium Semi-Matte Archival paper. The giclee printing process provides better color accuracy than other means of reproduction. All giclees come with a Certificate of Authenticity and will be signed by the artist. Tarot Card prints are 8 1/4" x 13"
Payment is handled by PayPal. Your order will ship approximately 3-4 weeks after clearance of payment. Shipping will be added to the order. U.S. orders are sent US Priority Mail. International shipping will need to be calculated. Contact Us with details of your order. Please use the most modern browser your system can handle. The Shopping Cart is optimized for the most recent versions of Safari, IE, Chrome, and Firefox. Purchase of a print does not include authorization to reproduce the image in any form. Listed below are a few of the tarot prints. Contact us at if you don't see the print you want and we will make it available. Features The Maiden, Mother and Crone. This is not a giclee and will be shipped rolled. Can be signed by request. 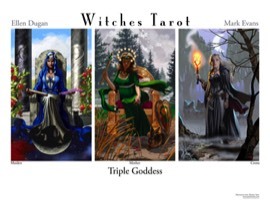 PRINTS AND POSTERS Please Note: Witches Tarot is ALWAYS sold as a set of a printed book and Tarot card set. There is NO other version.